"For a brief moment I abandoned you, but with great compassion I will take you back." And you did not receive the "spirit of religious duty," leading you back into the fear of never being good enough. 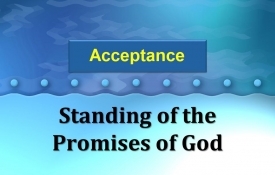 But you have received the "Spirit of Full Acceptance," enfolding you into the family of God. And you will never feel orphaned, for as he rises up within us, our spirits join him in saying the words of tender affection, "Beloved Father, Abba!" Remember the prophecy God give in Hosea: "To those who were rejected and not my people, I will say to them: "You are mine." And to those who were unloved I will say: "You are my darling." Now you are no longer a slave but God's own child. And since you are his child, God has made you his heir. The Spirit Himself testifies together with our spirit that we are God's children, and if children, also heirs-heirs of God and co-heirs with Christ-seeing that we suffer with Him so that we may also be glorified with Him. It is not merely the natural offspring of Abraham who are considered the children of God; rather, the children born because of God's promise are descendants. "I will be a Father to you, And you shall be My sons and daughters, Says the LORD Almighty." God answered, "I will be with you. And this is your sign that I am the one who has sent you: When you have brought the people out of Egypt, you will worship God at this very mountain." My father and mother walk out and left me, but God took me in.